Interpreting the results of the POSE test varies slightly for each section. In addition, no test is an adequate substitute for the understanding and knowledgeable teacher. Thus, while the results of each section of the POSE test may give some indication of students' abilities in speech perception, teachers should follow up with additional screenings and practice if needed. To learn about interpreting the results of a specific section of the POSE test, including suggested practice activities, click on one of the tabs below. 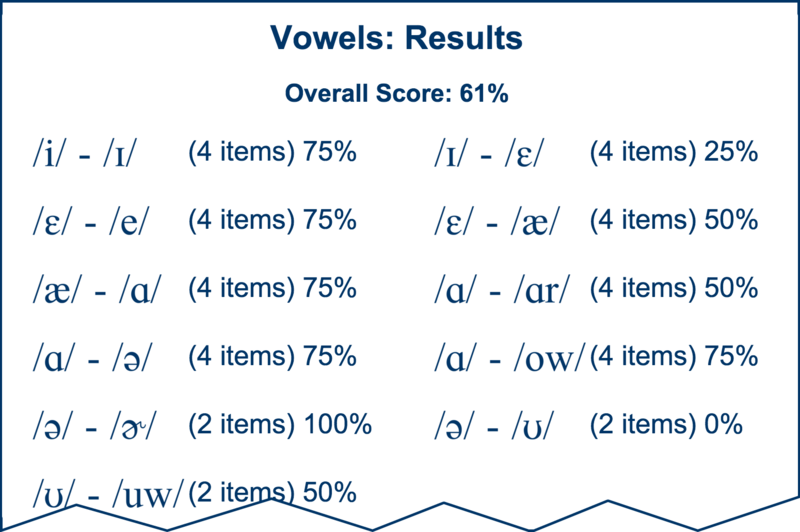 This page lists the contrasts in the vowel section, along with the total number of items and the percentage of items the student got correct for that contrast. If the score for a specific contrast is 75% or greater, the student generally does not have a problem with that contrast. Remember, for most contrasts, there are only 2 or 4 items per contrast. Thus, if a student got 50% on a contrast with only 2 items, more diagnosis may be needed to determine if that particular contrast is a problem for that student. Comparing scores on each contrast across all students in a class may give a teacher a better idea of which contrasts to focus on in practice activities. There are many different ways to help improve speech perception skills. An excellence resource for practice speech perception and pronunciation is Pronunciation Matters (Henrichsen, Green, Nishitani & Bagley, 1999). This book contains stories that help isolate each vowel and consonant contrast, as well as each word stress, intonation, and sentence stress pattern, and that make learning these patterns and contrasts fun. The book is available for purchase chapter-by-chapter at http://pronunciationmatters.com. Below are some suggested ways to practice speech perception. This list is not complete. If you have any suggestions of ways to practice speech perception, please feel free to contact us. Create some minimal pairs that contain the two contrasts you wish to practice. Sentences work best, but are harder to create. Write these sentences or words on cards, or draw pictures on the chalkboard. Then, have someone say each sentence or word in a random order. The listener points to the picture or card that illustrates the correct sound. Keep practicing until the listener can point to the correct card/picture each time. 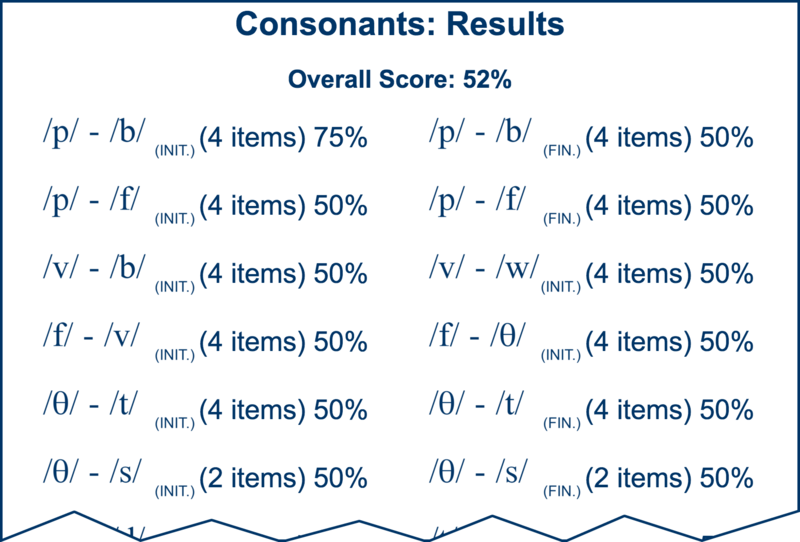 This page lists the contrasts in the consonant section, along with the total number of items and the percentage of items the student got correct for that contrast. Remember, some contrasts are syllable-initial, while others are syllable-final. This is notated next to the contrast on the results page. If the score for a specific contrast is 75% or greater, the student generally does not have a problem with that contrast. Remember, for most contrasts, there are only 2 or 4 items per contrast. Thus, if a student got 50% on a contrast with only 2 items, more diagnosis may be needed to determine if that particular contrast is a problem for that student. Comparing scores on each contrast across all students in a class may give a teacher a better idea of which contrasts to focus on in practice activities. Create some minimal pairs that contain the two contrasts you wish to practice. Sentences work best, but are harder to create. Remember to include both syllable-initial and syllable-final minimal pairs where appropriate. Write these sentences or words on cards, or draw pictures on the chalkboard. Then, have someone say each sentence or word in a random order. The listener points to the picture or card that illustrates the correct sound. Keep practicing until the listener can point to the correct card/picture each time. 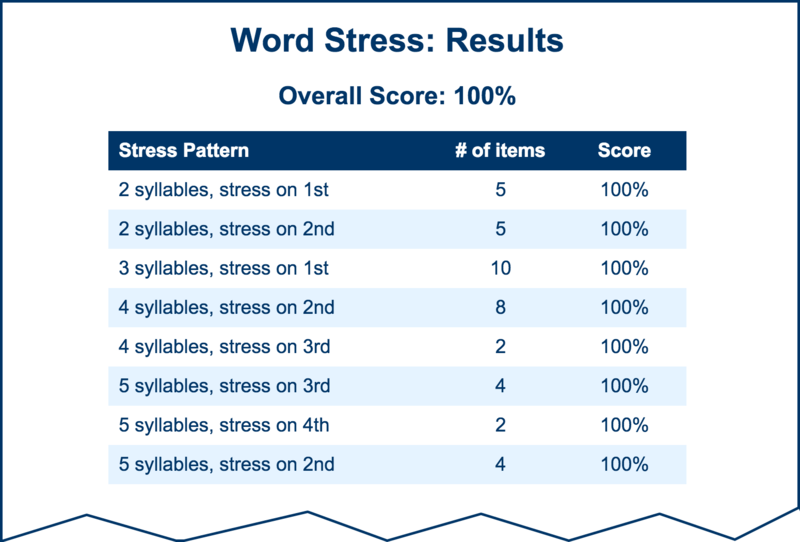 This page lists the different syllable-stress patterns, along with the total number of items and the percentage of items the student got correct for that pattern. If the score for a specific pattern is 75% or greater, the student generally does not have a problem with that pattern. Comparing scores on each contrast across all students in a class may give a teacher a better idea of which stress patterns to focus on in practice activities. Please look at this excellent website on word stress in English (http://www.teachingenglish.org.uk/think/articles/word-stress). This site discusses word stress in English and gives some good practice exercises to help improve students awareness and skills in perceiving word stress. This section focuses on the perception of rising and falling intonation at the end of an utterance, specifically focusing on distinguishing between questions and statements (Intonation 1) and the use of tag questions in looking for information or making comments (Intonation 2). 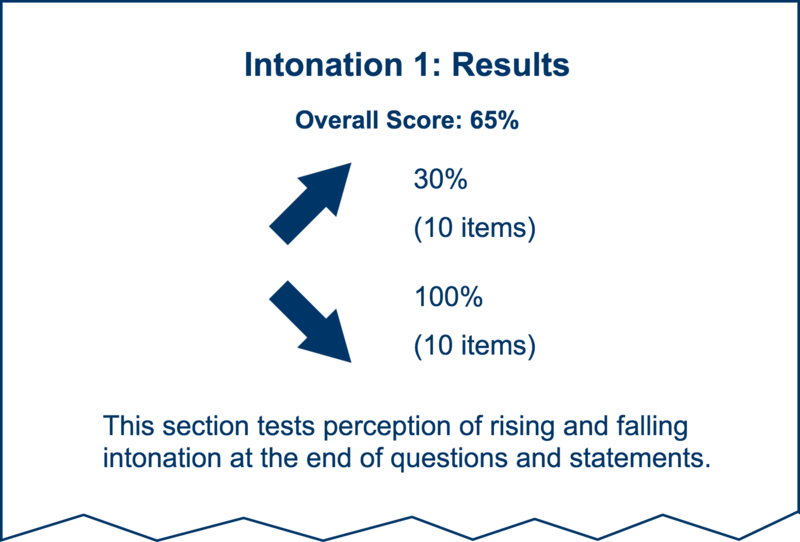 The results page will show the overall score for items with rising intonation and falling intonation, and will indicate if the test focused on questions/statements or tag questions. Comparing scores on each contrast across all students in a class may give a teacher a better idea of which intonation patterns to focus on in practice activities. Create some sentences that fit the pattern of either questions versus statements (Intonation 1) or the use of tag questions (Intonation 2). Have the student practice saying the sentences using rising or falling intonation, and you or someone else telling the student what you heard. This will help the student understand how others hear him/her when speaking. Create some sentences that fit the pattern of either questions versus statements (Intonation 1) or the use of tag questions (Intonation 2). Say the sentences using either rising or falling intonation. Have the student point or indicate what they heard (rising or falling). Keep practicing until the student can correctly perceive each sentence as it is said. This section focuses on the perception of stress words in a sentence (Sentence Stress 1) and "thought groups" (Gilbert, 1993, p. 77) or the use of pauses in a sentence to separate ideas (Sentence Stress 2). The results page will show the overall score for that section along with an example of what the section is testing. Comparing scores on each contrast across all students in a class may help the teacher determine if practice on sentence stress is needed in practice activities. Please look at this excellent website on sentence stress in English (http://www.teachingenglish.org.uk/think/articles/english-sentence-stress). This site outlines the importance of sentence stress and its impact on understanding spoken English. It also gives some good practice exercises to help raise student awareness of sentence stress issues.